The most wonderful thing about Tigger is that he’s the only one. Or is he? That’s what Tigger sets out to find in The Tigger Movie, Disney's charming 2000 film, now available on Blu-ray. Up to his usual antics, bouncing around trying to find someone to play with him, Tigger decides to go on a bouncy, flouncy journey to find his family tree--the tallest, stripy-est tree in the whole Hundred Acre Wood--or so he thinks. Even with the help of his friends, things don’t turn out quite as expected, resulting in Tigger venturing out on his own into a dangerous snowstorm. But, in the end, with the help of Pooh, Piglet, and especially little Roo, Tigger learns that family is not necessarily just aunts and uncles and granny and pappy, but the people who care about you and love you the most. Saturday mornings are made for this. I curled up with my toddler Nicholas in my lap, popped on The Tigger Movie and reveled in the snuggles and cuddles while we giggled along with Tigger, Pooh, Piglet, Roo, Kanga and the whole gang. 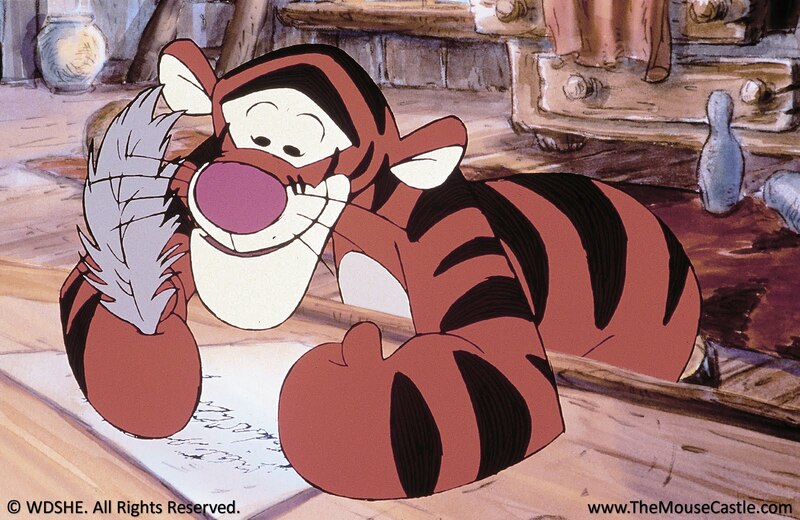 The Tigger Movie is sweet, charming and wholesome fun to curl up with your kids and enjoy. The Blu-ray disc has fun special features. You'll find some Tiggerific short clips from several Winnie the Pooh movies, plus A Tigger Tale, which includes interviews with director Jun Falkenstein, producer Cheryl Abood, animator Jeff Johnson, composer Richard Sherman, and art director Toby Bluth as they discuss Tigger's film and literary history and how it influenced The Tigger Movie. Nicholas and I ended up watching and playing along with the intermission way more than we expected. This mommy wishes Disney would put the interactive intermission on more movies. Until I sat down to watch Pocahontas with my children, I hadn't seen it in about 10 years. My daughter loved the Disney princesses when she was small so it was part of the rotation in our home for a long time and a well-loved movie. My boys, however, had never seen it, so I was curious to see what their reactions would be. When my 13-year old boy was little he was all about everything Buzz Lightyear and had no time for princesses, but when we watched Pocahontas, he was enchanted particularly by the music, songs he had grown up listening to. My almost 3-year old son has now asked to watch it three times since his first viewing. I take that as a very good sign. There are certain Disney songs that become a part of our personal history. They speak to us in ways that stand out and move us. 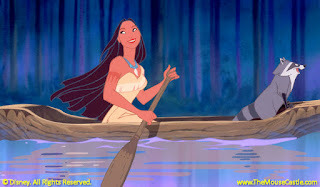 The songs of Pocahontas have always done that for me. I had forgotten how "Steady as a Beating Drum," sung over the opening credits, could send a chill through me. And you can be sure I'll be belting out "Just Around the River Bend" and "Colors of the Wind" off-key as I drive down the freeway this week. Composer Alan Menken and lyricist Stephen Schwartz made magic together with the soundtrack for Pocahontas. Released in 1995, it went on to win Academy Awards for Original Score and Best Song ("Colors of the Wind"). "Colors of the Wind" was also honored with a Grammy for Best Song Written Specifically for a Motion Picture or Television. 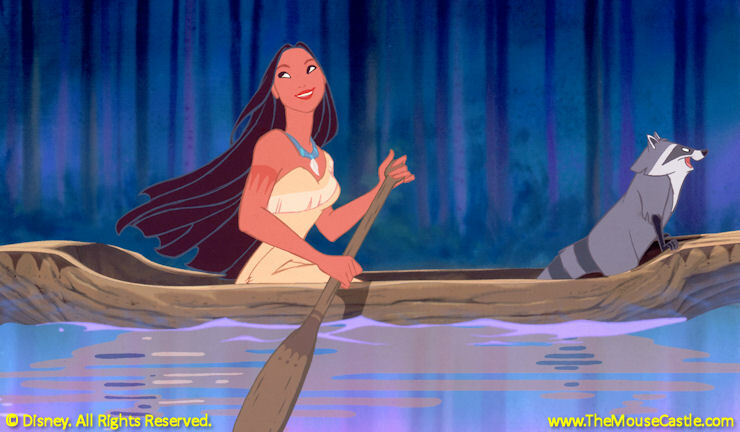 I'm glad I’m not the only one who loves the music of Pocahontas. It will always stir up such a range of feelings and emotions for me. feature based on characters that really existed--and one of the few features to not have a happily-ever-after. Historians dispute how much of the Pocahontas-John Smith legend is actually true, and Disney took plenty of artistic license with the legend, but the movie works musically, visually and emotionally. Included in the new Pocahontas Two-Movie Collection Blu-ray Combo Pack is the 1998 direct-to-video sequel Pocahontas II: Journey to a New World. Admittedly, it's not my favorite Disney film, but it's still an amusing movie to watch. virtually silent, but is very expressive and provides welcome comic relief. In fact, he became my favorite character in the movie. Pocahontas must prove to the King that she and her people are worthy of respect without compromising who she is. In the process, she struggles to fit in with the culture and customs of England. She is invited to a hunt ball and must don an elegant gown (complete with hoop skirt and high heels) to show just how civilized she is. Throughout the evening, she is confronted with challenges meant to show her as an uncivilized savage. When her nemesis, Ratcliffe (David Ogden Stiers), arranges for entertainment at the ball designed to offend and incite a reaction from her, she finds the strength within herself to throw aside the silly trappings of so-called civilized society. She'll listen to her heart and discover there just might be a way to help her people and to find the love that has been missing since John Smith sailed away. I have to admit, Pocahontas II surprised me. It was a very entertaining movie to watch with my children. You can't watch the home video release of Disneynature's Chimpanzee without gaining an incredible respect for the talent and grit of its film makers. Take time to view On Location: The Making of 'Chimpanzee' on the Blu-ray disc and you'll witness firsthand the extreme conditions they had to endure just to capture a few seconds of usable footage each day. High humidity, torrential rain, relentless swarms of bees and all manner of poisonous snakes and insects were standard issue during the more than three years it took to film Chimpanzee in the remote rain forests of the République de Côte-d’Ivoire. Camera crews would often trudge for hours carrying heavy equipment through dense vegetation just to get to where the chimpanzees lived. Chimpanzee was a difficult, but rewarding, passion project for this committed group of professionals. As principal photographer Martyn Colbeck noted, "There must be easier ways to make a living, but they're not as much fun." It was definitely not easy, but the results were exquisite. 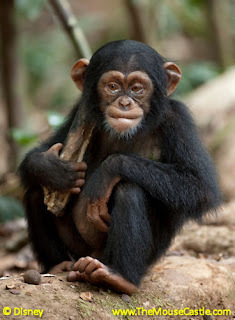 Chimpanzee is a stunningly beautiful film and the most emotionally compelling entry in the Disneynature series. The documentary focuses on young Oscar, a baby chimpanzee being raised by his mother, Isha, among a group of chimps led and protected by the strong and dominant Freddy. Oscar is every bit as playful and high-spirited as his mother is doting and responsible. And he's also pretty darn cute. With his mother's guidance, Oscar learns the ways of the rain forest--how to forage for food, how to crack open the nuts that are the staple of their diet, and how to remain safe from predators. It's a largely idyllic existence. They eat, they frolic and play, groom, repeat. That is, until a rival group of chimpanzees challenges Freddy's turf and brings tragedy upon poor Oscar. 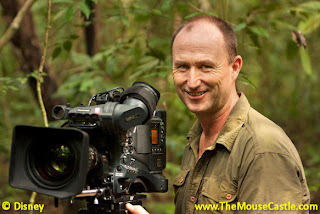 In wildlife documentaries, it's never enough to just find a group of animals, set up your tripod and start shooting. There needs to be a story to tell, with a helpful twist of fate or two to bring the story to life. And then, the camera has to be there to record it. There are no second takes in nature. When Isha was killed, director Alastair Fothergill thought his film was through. Unprotected in the wild, Oscar wasn't expected to survive. And without him, there was no story. "We thought the film was over," said Fothergill. "We were about to ring up Disney and say, 'Guys, we haven't got a movie.'" Then something remarkable happened. Freddy began looking after Oscar, an act rarely scene among chimpanzees and never before caught on film. Here was the alpha male of the group essentially adopting the young chimp and caring for him as his own. Freddy protected Oscar, groomed him and made sure he was fed. And the cameras caught every moment of it. These are very sweet, very tender and very real moments that give Chimpanzee its life. Certainly, there are gorgeous wide shots of the lush green rain forest (the tracking shots of the forest canopy from specially-designed cable rigs are amazing), but it's when the cameras get down to ground level amid both the serenity and chaos of chimpanzee life that special things happen. It's proof that even with the determination of talented film makers in a harsh natural environment, sometimes it's still better to be lucky than good. Chimpanzee is available now on Blu-ray/DVD Combo Packs and digital download. Make your purchase by August 27 and Disney will donate a portion of the sale to the Jane Goodall Institute to help save chimpanzees in the wild. 1. I haven't plugged the Walt Disney Family Museum in a while. 2. I need to mention how cool the Museum's new website looks. 3. I've loved stop motion animation since the first time I saw King Kong and Jason and the Argonauts. These are all quite valid. 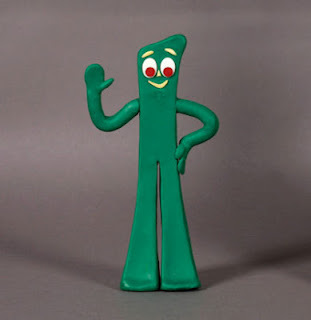 But, the real reason I'm writing this is it's an excuse to post stuff about Gumby. Hey, Disney meant a lot to me growing up, but Gumby wasn't that far behind. "He was once a little green slab of clay..." Pokey. Prickle. Goo. Blockheads. Gentle morals to every story. And all presented in Art Clokey's inspired claymation stop motion style. The Walt Disney Family Museum will celebrate Clokey's work, as well as that of other stop motion masters like Ray Harryhausen, Willis O'Brien and Henry Selick, when the special exhibition Between Frames: The Magic Behind Stop Motion Animation debuts in the Museum's Theater Gallery next month. It's hard to go wrong when you have Paul Frees as the voice of God. It also doesn't hurt to have future Disney Legends Bill Justice and X. Atencio providing the "character movement." Between Frames will display original armatures from The Nightmare Before Christmas and Coraline, puppets from Robot Chicken and a Digital Input Device (DID) used in Jurassic Park. There will also be behind-the-scenes photos from O'Brien's The Lost World and Harryhausen's Jason and the Argonauts plus original storyboards from Selick's James and the Giant Peach. 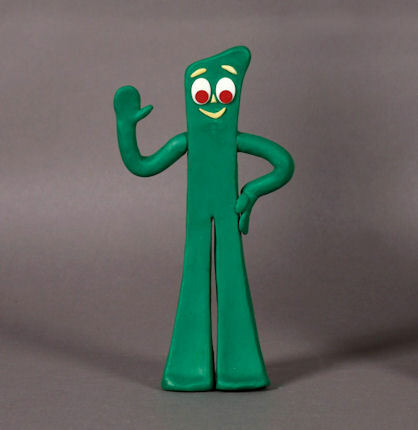 And did I mention Gumby? Because if you have a heart then Gumby's a part of you. Between Frames: The Magic Behind Stop Motion Animation is curated by WDFM Registrar and Curatorial Assistant Anel Muller. The exhibit will run from September 27 through April 28, 2013. For more information on the Walt Disney Family Museum, visit www.waltdisney.org. This is the conclusion of my three-part interview with Susan Egan, the original Belle in Broadway's Beauty and the Beast and the voice of Meg in Disney's Hercules. For part one, click here. For part two, click here. Nina: Mom, when you pretended to be Belle, you had a yellow dress? Susan: Yes, I had a yellow dress. Nina: You had long hair? Susan: Mmm hmm, yeah I did. Nina: Ariel is my favorite princess. There's nothing like the sweet, innocent, brutal honesty of a child. "I played so many princesses," said Susan, "and so many little girls liked to meet me at the stage door, that I foolishly thought someday when I'm a mom and have little girls, they're going to think I'm pretty cool. How naive." Susan's friends, of course, gleefully fueled the fire when it was time for Nina's birthday. "Do you know how many Ariel Barbies she got? And Ariel swimming light-up Barbies for the bathtub?" By Susan's account, Nina's favorite princesses are, in order, Ariel, Rapunzel, Tiana and Pocahontas. "It's ok if she doesn't like Belle," Susan added. "It's kind of brilliant. And, by the way, I have another daughter now who also is obsessed with Ariel. You know, it's just God's little joke." Susan may not have been Nina's favorite princess, but she's still Nina's favorite mommy, a role Susan relishes playing. Never did she appreciate it more than a few years ago. "I was up for a really huge TV show as a mom when Nina was probably 18 months old. It was callback, callback, callback. It was one of those things when you're like, 'This is it. This is the one.' Everything about it made sense. I did really well. And then, the final audition, it was between me and one other actress, and in the room with all the executives--it's the 900th time (I've) done the scene--it just doesn't land. I just went 'THUNK.'" Susan lost the part and shared her disappointment with her husband, Robert, via text. After a few exchanges, Robert chimed in with, "It's okay. You still get to be Nina's mommy." Susan's spirits lifted. "I rebounded in the second I read it. And I just thought, 'What a blessing,' you know? Nothing is as important as it used to be, because the only thing that's important now is her. "I would so rather go home right now and deal with whatever dramas she's creating than get hung up on not getting this job." Parenthood puts everything in perspective. It's this appreciation of what's truly important that inspired "Nina Doesn't Care," a song Susan co-wrote with musician Brian Haner for her 2011 CD The Secret of Happiness. As Susan explained, "Nina doesn't care if I get a great review. But, Nina doesn't care if I get a crappy review. And so, thank God." By the way, the woodland creatures that populate the "Nina Doesn't Care" video were animated by Ken Duncan, the same person who was supervising animator for Susan's Meg in Hercules. The Secret of Happiness is Susan's sixth solo CD in a busy entertainment career that's included live vocal performances with the National Symphony Orchestra, Hong Kong Symphony and Los Angeles Philharmonic. Over the years, she's appeared on stage at Lincoln Center, Carnegie Hall, the Kennedy Center and the Hollywood Bowl. She's also taught master classes at USC, Pepperdine and other universities across the country. This fall, Susan will travel to Spain to perform in concert and to give a master class in Madrid. While Susan's work has spanned from the recording studio to Broadway, from television to film, she's always had a special fondness for the stage. "I like the live performances," she said, "because I like meeting the audience. I like being in the same room as they're in." Her repertoire includes a number of cabaret shows she's done with her longtime friend and collaborator, composer Georgia Stitt. "I'm like her alter-ego and she's my alter-ego. We're in the same place in our lives." Susan and Georgia share a special bond by both having two daughters around the same age. In fact, their second girls were born three weeks apart. Ever the consummate performers, Susan and Georgia saw their mutual pregnancies as an opportunity to create a new show. Said Susan, "The last time we were pregnant, I told Georgia about a concert I did the first time I was pregnant. 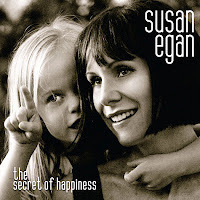 I did a concert in New York called 'Susan Egan: All Knocked Up' and it was really funny. I had what I called a 'pregnancy medley.' It's songs you know and love, but they just somehow sound different coming from a really pregnant woman. Like 'I've Got You Under My Skin' or 'I Get a Kick Out of You'--this whole medley of just stupid Cole Porter and Gershwin and stuff." With that in mind, Susan talked her friend into doing "Susan and Georgia: All Knocked Up," which went on to become a hit in both L.A. and New York. It wasn't long before Georgia suggested that with a few tweaks, their show would work well with them performing just as moms. Susan agreed. So, ever since, as circumstances and their schedules allow, Susan and Georgia take the stage together as working moms. Susan said, "We did a Disney social media moms concert last year that was just like a rock concert. It was crazy." "So, we had a great time on the cruise, but about 40 minutes before our concert was supposed to go up, we are in our cabin. We've got four girls under the age of five in a bathtub. They're splashing us. We're in our gowns, in our makeup. They're all soapy-sudsy. And we're trying to get them out and dressed so that the babysitter can watch them while we go and do a show. And it was just in the middle of being splashed that Georgia turns to me. She's like, 'How's it feel to be a big Broadway star?' And I just started laughing. "On our flight home, when the girls are sleeping, I turn to Georgia. I go, 'It's glamour and goop. That's what we do. We're just like any other working moms.' The range is a little bit more juxtaposed because sometimes we put on sparkly dresses and we stand in the spotlight. But really, we're just a bunch of working moms trying to multitask." Glamour and goop. They define the singer-actress who dazzled audiences as Belle and charmed movie-goers as Meg. They're the highs and the lows, the successes and the disappointments of a working mom in a show business life. And they'll always present themselves in different forms when they're least expected. Said Susan, "Sometimes the glamour is coming home to Nina, and not getting the job is the goop. And sometimes the glamour is, you know, being awarded a big award and the goop is your daughter throwing up on your beaded dress right before you have to go. So, it always changes. It makes life so fun." You can keep up with Susan on her website, her Facebook page and on Twitter. You can also follow her with her partner in crime, Georgia Stitt, on their blog, appropriately named Glamour & Goop. This is part two of my conversation with Susan Egan, the original Belle in Broadway's Beauty and the Beast and the voice of Meg in Disney's Hercules. Hate walking into the middle of a conversation? Click here for part one. Susan Egan records the voice of Meg in Hercules. While Susan was still in New York with Beauty and the Beast, Disney was looking for an actress with Broadway chops to voice Megara in Hercules. At first, Susan was very interested, but Disney was not. "They wouldn't let me audition for it. Because, I was Belle. And they're like, 'You're not right for Meg at all.'" Susan persisted. "I just kept begging and begging and begging. Literally, to shut me up, they let me go in and audition." At the audition, she was relieved to see familiar faces from Beauty and the Beast, including composer Alan Menken and musical director Michael Kosarin. But, despite the friendly atmosphere, Susan still found the experience disconcerting. "You're standing in front of a microphone and they say, 'We're going to tape your audition.' And then, they all put their heads down." Their heads were down because they were looking at drawings of Meg to see if they worked with the voice they were hearing. It made sense, but it wasn't the type of audition Susan was used to or was even expecting. Susan drew her inspiration for Meg from 1930s and 40s Hollywood actresses. "I've seen every Bette Davis (film), every Joan Crawford, every Barbara Stanwyck, every Lauren Bacall. I've seen them all. There's a cadence to those 30s movies. It's that mid-Atlantic accent, but it's got this sing-songy cadence. "I don't know why it made sense to me, but probably because I was single and living in New York. The peak of my day was at 10:30 at night, so I was up until three or four in the morning. And then I'd sleep 'til 11 and all that was on TV were all these old movies [laughs]. And I watched them every night." So, Susan channeled her favorite femme fatales and the audition went very well. "All these heads that were looking down at the table, one by one they popped up. And they went, 'Ohhh.'" And then the waiting began. "There's no callback," said Susan, "because the callback is the tape--this is how long ago it was--it was actually a cassette tape that then goes through all the callbacks and it took about nine months." Every now and then, Susan would hear from Kosarin that she was still in the running for Meg. Finally, when she was in Los Angeles, she made the breakthrough. "I am now at the Shubert Theater doing Beauty and the Beast and Eisner is walking down the hallway and he's like, 'Hey, great audition for Hercules!" And I'm like, 'I've made it as far as Eisner! Good, okay.'" By then, test animation had been done with Susan's voice. It was a good fit. Later that week, she got the job. When recording at the studio started, Susan learned quickly that directors John Musker and Ron Clements were after more than just her voice. To assist the animators with her character, all her body movements and facial expressions were filmed. "I don't look anything like Meg, " said Susan, "but when the movie came out eighteen months later, my friend Laura said, 'It's the first time I ever recognized you in a performance.' She's like, 'Belle, you're acting. I forget it's you. Meg is so you.'" Susan recalled early in production going over the storyboard for Hercules. One particular drawing showed Meg saying, "Thanks for everything, Herc. It's been a real slice" while she sliced the air with her hand. Looking at the drawing, Susan commented to producer Alice Dewey, "That is so weird. I did that at my audition." Dewey replied, "Where do you think we got it from?" That "real slice" line would turn out to be problematic. Musker and Clements really loved how Susan delivered the line at her audition; so much so, that they went to great lengths to get her to recreate it in the recording studio. "They couldn't use (the audition tape) because there was ambient noise," said Susan. "I mean, it was an audition space in New York City. You could hear the traffic." Over and over again, Susan repeated the line. "Thanks for everything, Herc. It's been a real slice." She would get close to what the directors wanted, but the audition always sounded better. She said, "They paid me for an entire session fee for me to go in and say the line exactly as I had. And they were never satisfied." The solution after all that work: digitally clean up the audio on the original recording. The line you hear in the movie is Susan's audition. Hercules is a fun, freewheeling film based as loosely as you could imagine on Greek mythology. The son of Zeus, Hercules, must prove himself to be a true hero in order to take his place among the gods on Mount Olympus. On this quest, he battles all manner of evil beasties, matches wits with the god of the underworld, Hades, and falls for the saucy Meg, who may or may not be in cahoots with Hades and who may or may not be the girl of Hercules' dreams. The film is full of smartly anachonistic pop culture references with an inspired song score by composer Menken and lyricist David Zippel. The movie may be set in ancient Greece, but the soundtrack is right out of Motown. Meg's signature song, "I Won't Say I'm in Love," is a '60s-style doo-wop number with solid backup vocals by the Muses, "goddesses of the arts and proclaimers of heroes" who serve as the ad hoc narrators of the film. Susan knew the ladies who voiced the Muses from Broadway, so in the recording studio, she was equal parts appreciation and intimidation about their talents, especially when it came to running off some gospel-tinged musical riffs. "I've never felt so white and square in a room as the day we recorded that song," explained Susan with a laugh. "Alan would say, 'Okay Lillias (White), just do a riff over there and LaChanze, you do a little something over here and Susan, just at the end, get from this note to this note and just do a riff.' I raise my hand and I'm like, 'Umm, can you plunk it out on the piano?' He looks at me like, 'Are you kidding?'" A half hour later, Susan got it down. Meanwhile, her Muses were peeling off one amazing riff after another. "They gave him twenty brilliant takes all different. It was terrible. It was so humbling." Working with her fellow voice actors was a bit less intimidating. Of course, Susan didn't spend a whole lot of time with them. Recording lines for an animated feature can be lonely work. Actors will lay down most of their voice tracks without other actors present so the directors and animators can more easily work with the material. On-screen conversations are often assembled from the best takes from the individual recording sessions. On the rare times actors do record together, the process can be pretty methodical. As Susan explained, "When you're doing the scripted scenes, you can't actually do it like you normally would, because they don't want any overlap. Because they want to be able to edit everything out. And then, once they get it that way, the way they like it, then the reason you're actually there is to then overlap like normal conversation. "I had a handful of sessions with Tate (Donovan, the adult Hercules) and a handful of sessions with James Woods (Hades). I actually never had a session with Danny DeVito (Herc's excitable trainer, Phil). I've still never met him." Susan tries to get a word in edgewise with James Woods. Once the scripted lines were done, Susan was given some leeway to improvise with her fellow actors. "With James Woods, that was hard," she recalled with a laugh, "because he never stopped talking." She had an easier time with Tate Donovan, not that everything she did made it into the final film. "(Hercules and Meg) had just seen Oedipus and Tate says, 'Boy, I thought I had problems.' I go, 'Yeah, there's a boy who loves his mother.' You know, kids would not have gotten it, but the parents would have. And, I think it would've been hilarious. It was so sad they wouldn't put it in there." Hercules premiered on June 15, 1997 and went into wide release on June 27. Critics were mostly enthusiastic. Owen Gleiberman with Entertainment Weekly gave Hercules an A-minus rating, calling it "delightful...a Disney fable savvy enough not to let its sincerity get in the way of its zippy multimedia charm." He called Susan's Meg "a refreshingly saucy maiden with big hair and a voice of suave huskiness." Refreshing, and definitely a departure from Disney's pantheon of damsels in distress, Meg is a complex and conflicted character that defies classification. "She's her own category," said Susan. "She's the only Disney heroine that starts off as Cruella de Vil and then becomes Belle. She's the only one that makes a change. She starts off on the evil side and then becomes the good side. So, where do you classify her? She's not a villain and she's not the heroine. And she's not a princess and she doesn't even get to be a goddess. "I love her. I wouldn't trade her for the world." Coming Friday: The conclusion of our story. Susan's played a princess and has been immortalized in Disney animation. Her daughter doesn't care.